This was the first time in Israel that a liver lobe donation took place between two unrelated people who didn’t even know one another. The altruistic donation of the liver lobe was conducted in 15-month-old Karish Faarmaar, son of foreign workers from India, who needed a liver transplant to save his life. Karish was diagnosed a week after birth with MSUD, a metabolic disease lacking enzymes to break down protein. Since his birth, he consumed a restrictive low protein diet via formula, but his life would have been very limited to his nutrition. Inappropriate treatment, incorrect nutrition and/or fever could have led to metabolic complications with neurological damage, worsening his condition and endangering his life. The donor, Michal Segal, 45, a mother of 5 from a religious village in the north of the country, decided to donate a liver lobe. With modesty and courage, she indicated that she did not know why such an act was considered so special and explained that she grew up with values of giving and loving your fellow man. All over the world and in Israel, great efforts are made to raise awareness to improve the public’s willingness to donate organs, but regrettably, the chasm between donors and those waiting for an organ transplant is widening and the list of recipients is only growing longer. In an extraordinary move, the altruistic liver lobe donation was approved in Israel by the National Transplantation Center. The operation was conducted by a team from the Organ Transplantation Department at Schneider Children’s headed by Prof. Eytan Mor: Dr. Michael Gurevich, in charge of pediatric liver transplantation, Dr. Sigal Eisner, senior surgeon, and Dr. Yaacov Katz, Director of the Surgical Suite and Anesthesia Department, and anesthetists Dr. Eli Simhi and Dr. Mila Katchko. Following the transplantation, Michal was transferred to Beilinson Hospital from where she was discharged. The infant Karish was transferred to the Pediatric Intensive Care Unit headed by Dr. Elhanan Nahum, after which he was transferred to Pediatrics “C” headed by Dr. Irit Krause for follow-up care by Dr. Orit Zinman-Weisbord, senior physician in the Institute of Gastroenterology, Nutrition and Liver Diseases headed by Prof. Raanan Shamir. The transplant was coordinated by transplant coordinator, Nurse Michal Shafir. The donation of a liver lobe from a living donor requires special preparation by the teams in the hospital including pediatric transplant surgeons, anesthetists, ultrasound technicians, surgical nurses, intensivists and so on. As part of the procedure, both the adult donor and child recipient enter adjacent operating rooms simultaneously. Initially, the liver lobe is removed from the donor after which it is transferred to the child’s operating room. The recipient undergoes the transplant while the donor’s operation is completed. As opposed to other organs, the liver has the ability to renew growth and can rehabilitate itself quickly even after serious damage and removal of any part. Therefore, it is possible to take part of a living donor’s liver (even up to 2/3 of the organ) and transplant it into another person. Within 8-12 weeks following surgery, the liver will grow by more than 90% from its pre-surgical size, both in the donor and the recipient. 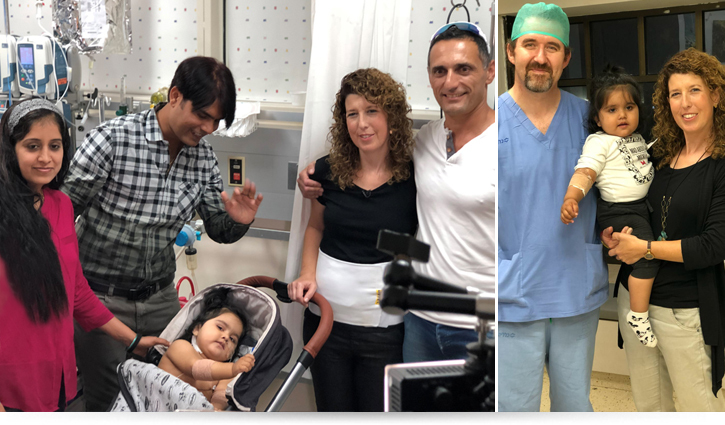 Schneider Children’s performs the majority of organ transplantations in children in Israel and is among the first in the world to conduct living donor-related liver lobe transplants in children. Since its establishment, Schneider Children’s has performed some 600 transplants of heart, lungs, liver and kidneys in infants, children and adolescents, with a success rate on a par with leading medical centers in the world.